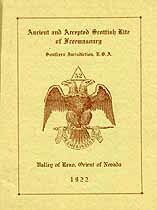 Ancient Accepted Scottish Rite of Freemasonry, Southern Jurisdiction, U. S. A., Valley of Reno, Orient of Nevada, 1922. Names in this online transcription include Abbay, Adams, Adcock, Aenchbachler, Airhart, Albert, Aldrich, Algner, Altinger, Anderson, Andis, Andruss, Anker, App, Archer, Arentz, Armstrong, Arnold, Aronson, Ast, Aston, Atkinson, Averhill, Avery, Ayers, Aymar, Bache, Backe, Badt, Bain, Baker, Balzar, Banish, Banks, Barber, Barcia, Barclay, Barnes, Bartley, Bartoo, Bates, Baum, Baxter, Bean, Bearse, Beatty, Bechtel, Beesley, Bell, Bellows, Belter, Benedict, Benham, Bennett, Bergeret, Bergerson, Bernard, Bernascond, Berry, Bertam, Bertholdt, Bethne, Bevan, Biddle, Bigelow, Bishop, Black, Blair, Bloomdale, Blount, Blum, Blunt, Bodine, Boggs, Bolt, Bones, Booth, Borden, Bording, Boyer, Bozarth, Bracken, Braden, Bradish, Bradner, Brambila, Brayn, Bresse, Briggs, Brittell, Brooks, Brown, Bruce, Bruhns, Brundige, Bruner, Bryson, Buckingham, Burdick, Burhans, Burkham, Burton, Busey, Bush, Butler, Butts, Byers, Cain, Calder, Calvert, Campbell, Cann, Carlon, Carlson, Carpenter, Carr, Carrico, Carswell, Carter, Casper, Catlin, Cave, Cazier, Chaflin, Chalfant, Chamberlain, Champion, Chandler, Chapman, Chick, Child, Childs, Chism, Christensen, Christianson, Christina, Church, Churchyard, Clark, Clarke, Clayson, Clegg, Clemmer, Clemons, Cline, Clussen, Coates, Cochran, Codd, Coffin, Cohen, Cohn, Colburn, Cole, Coll, Collins, Colvin, Comer, Cook, Corbett, Corle, Cornell, Covertson, Cox, Crabtree, Crawford, Crider, Crocker, Crook, Crosby, Cross, Crowley, Cullen, Curns, Curto, Cutler, Cutts, Dady, Dahl, Dakin, Daniel, Darling, Daseler, Date, David, Davis, DeArmond, Decker, Dempsey, DeRuchia, Dewar, Dickenson, Dickerson, Dinsmore, Dodge, Dolf, Donaldson, Dorn, Dorothy, Dotta, Dougherty, Doughty, Douglas, Douglass, Downs, Doyle, Drossell, Duborg, Dunaway, Duncan, Dunseath, Duplessis, Dupont, Durham, Early, Eaton, Ede, Edlind, Edwards, Egger, Elbeschutz, Elliott, Ellis, Ellsworth, Emerson, Emery, Englebright, Erb, Erickson, Ericson, Ernst, Erwine, Evans, Eveleth, Everett, Faith, Falconer, Falk, Fall, Fant, Farr, Faust, Fenwick, Fife, Finninger, Fisher, Fitzgerald, Flagg, Fleming, Flentge, Fletcher, Flood, Folsom, Foltz, Foorman, Forbes, Forman, Foster, Fowler, Fraser, Fravel, Frazier, Frederickson, Fredin, Fredson, Freeman, French, Freudenberger, Frey, Friedhoff, Friedman, Frohlich, Froman, Fuller, Gallagher, Gallery, Galvin, Gardiner, Gardner, Gasho, Gault, Gayhart, Geisthorpe, Getchell, Gibson, Gildner, Gill, Glenn, Glynn, Gnad, Goodwin, Gori, Gorman, Graham, Grant, Gray, Gregorich, Gregory, Griffith, Grigsby, Grill, Griswold, Grob, Guild, Gurr, Hackett, Haggbloom, Haight, Hallowell, Ham, Hamilton, Hamlin, Hancock, Hand, Hanford, Hanks, Harbaugh, Harcourt, Hardy, Harker, Harper, Harris, Hart, Hartson, Harvey, Hasman, Hauck, Haug, Hawkins, Hawley, Hawn, Hawse, Hays, Hecker, Hedden, Heidtman, Heinzman, Heizer, Henderson, Henry, Herrick, Herz, Hess, Hesson, Highland, Hildebrand, Hill, Hoffman, Hogerton, Hogue, Holland, Holmes, Holmshaw, Holtman, Hood, Horton, House, Howland, Hoy, Hudgens, Humphrey, Hunter, Hunting, Huntington, Inkenmulder, Ish, Isham, Iverson, Jackson, Jacobs, Jacobus, Jahn, Jameson, Jarrett, Jeffrey, Jenkins, Jensen, Jenson, Johns, Johnson, Johnston, Jonasen, Jones, Joyce, Judd, Juniper, Kane, Karch, Kennedy, Kent, Kershaw, Keyser, Kidd, Kienzie, Kind, King, Kirkley, Kitto, Kleppe, Kline, Knight, Knowles, Koontz, Korn, Kornmayer, Krater, Kuhn, Lacey, Lachman, Laffranchini, Laflan, Lamb, Lane, Lanka, Larson, Lawson, Leahigh, LeCount, LeCyr, Lee, Leffingwell, Leicham, Leishman, Lemaire, Lever, Levy, Lewers, Lewis, Libbey, Liddell, Lidsay, Lievre, Lincoln, Lind, Lindroth, Lindsay, Linstrum, Lippman, Lister, Lloyd, Lockman, Lockwood, Looser, Loosley, Lord, Loring, Lovelock, Lund, Lutts, Lynch, Lyon, Lytton, MacDairmid, MacDonald, Machabee, MacNair, Macris, Magnusum, Malone, Manheim, Mannington, Maraska, Marchmant, Mare, Markman, Marks, Martin, Marvel, Mason, Mathews, Matteeson, Matthieson, Matzdorf, Maxon, Mayer, Mayhugh, Mayne, McAuley, McBride, McCaulley, McClure, McCollum, McCormick, McCraney, McCray, McCulloch, McDonald, McGinty, McGregor, McIntosh, McIver, McKay, McLeod, McMullin, McNaughton, McQuarrie, McQueen, McRae, Meagher, Menardi, Meredith, Meyer, Middaugh, Miles, Millar, Millard, Miller, Milliken, Minoletti, Mogensob, Moler, Monk, Montgomery, Moody, Moore, Moran, Morey, Morgan, Morris, Morton, Mundy, Mushett, Myers, Nantker, Neal, Neff, Neilly, Neilson, Nelson, Nesbitt, Newitt, Newman, Ninnis, Noble, Norcross, Norris, North, Norton, Nunnelley, O'Brien, O'Neil, Oddie, Olinder, Oliver, Oliveros, Olmsted, Olsen, Organ, Orr, Osgood, Owen, Owens, Painter, Palmer, Paris, Park, Parker, Paterson, Patrick, Peak, Pedrick, Peebles, Pennock, Penrose, Perazzo, Percival, Percy, Perkins, Perrin, Peterman, Peterson, Phillips, Pickett, Pierce, Piercy, Pike, Piper, Pitt, Pittman, Pitts, Pittson, Plummer, Poe, Pohl, Poole, Pope, Popple, Porter, Potter, Poulson, Powell, Powers, Preston, Price, Prince, Pringle, Prouty, Putney, Pyeatt, Rainwater, Raley, Ralph, Raymer, Raymond, Reading, Redford, Reedall, Rees, Regil, Reid, Reilly, Reinhart, Revert, Rhine, Rhodes, Rhudy, Rice, Richards, Richardson, Richter, Ridgeway, Riley, Riswood, Robe, Roberts, Robeson, Robinson, Robison, Rodell, Rogers, Rose, Ross, Russell, Ruvane, Sadlier, Salisbury, Salter, Sanders, Savage, Saviers, Sawvell, Sawyer, Schadler, Scheeline, Schelvely, Schmidt, Schollars, Schrader, Schramm, Schwarzschild, Schweble, Scott, Seagrave, Secor, Seina, Sellstrom, Semenza, Seright, Seybolt, Seymour, Shaber, Shearer, Shepherd, Sherman, Shields, Short, Simms, Simpson, Sinclair, Skeels, Skinner, Slater, Slopansky, Small, Smith, Smoot, Snyder, Somerville, Sommers, Southworth, Sowell, Spann, Spaulding, Spear, Speers, Spencer, Spitzer, Sprague, Spreyer, Springer, Squires, Stark, Starr, Statesbury, Stavert, Steele, Steen, Steiner, Steinmiller, Stephen, Stephens, Sterling, Stewart, Stickney, Stilwell, Stimmel, Stinson, Stone, Stott, Stowell, Strassberg, Stunden, Suffall, Summerfield, Summers, Sutherland, Swanson, Taber, Talt, Tanner, Tarner, Tasem, Taylor, Terwilliger, Thacker, Thomas, Thompson, Threlkel, Tinder, Tippett, Totten, Treat, Trimble, Truett, Turner, Twaddle, Twiss, Umber, Underwood, Van Meter, Vance, Vanderhoof, Vaughan, Vencil, Vernon, Vicks, Vittle, Von Tobel, Voorhes, Waage, Waddell, Wagner, Wales, Wallace, Wallstab, Walsh, Walther, Watkins, Watland, Watson, Watterson, Weaver, Webb, Weck, Weeks, Weiland, Welker, Welland, Wells, Welsh, Welshons, Welty, Wernse, West, Westall, Whallon, Wheeler, Whitehead, Whiteley, Whitemore, Whitesides, Whitmore, Wickes, Wiest, Wilcox, Wildassin, Wiley, Wilkie, Wilkinson, Willi, Williams, Willis, Willmott, Wilson, Wise, Wolf, Wolfe, Wood, Woodward, Work, Workman, Wren, Wright, Yirak, Young, Youngren, Zern. The Genealogy Today catalog number for this item is 15039. When inquiring about the information in this resource, please mention the catalog number.